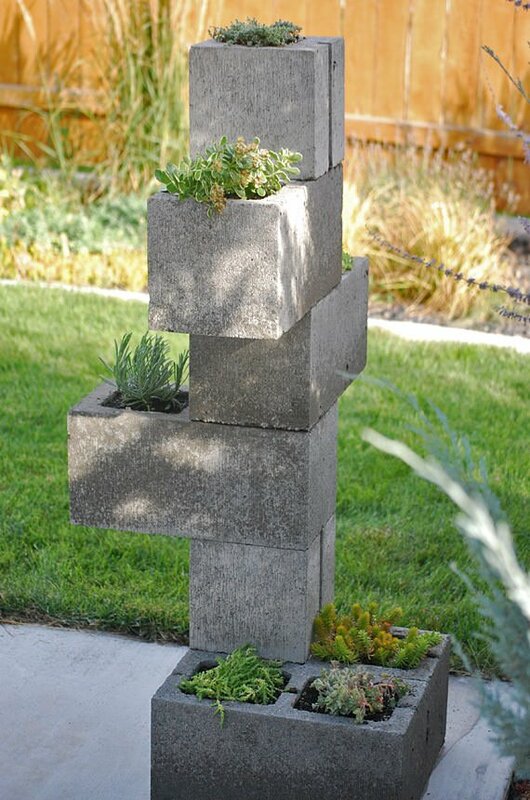 You may have seen other cinder block planters circulating the internet. Well we decided to post a version ourselves, because they’re just… so. darn. cool. We wanted to try one of our own, but do it a little different. So we went up! 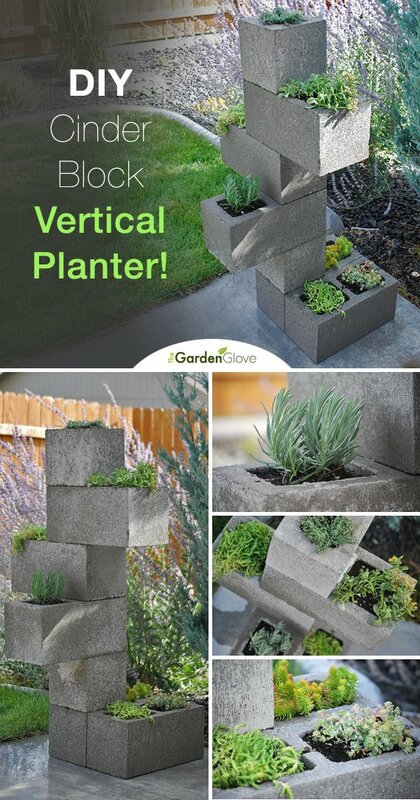 We made this DIY cinder block planter go vertical, and we did it in an afternoon. The cool thing about this project, is you can pretty much make it as big or small as you want… Just buy more concrete blocks! We recommend you play with the design…which blocks go which way, how far you can go with weight and stability,etc… then take a photo of the completed idea. We did this right in the aisle at Home Depot, so we would know how many blocks to buy. Buy a couple extra for flexibility. We capped the bottom of the planter section with these metal flashing squares and some landscape adhesive. 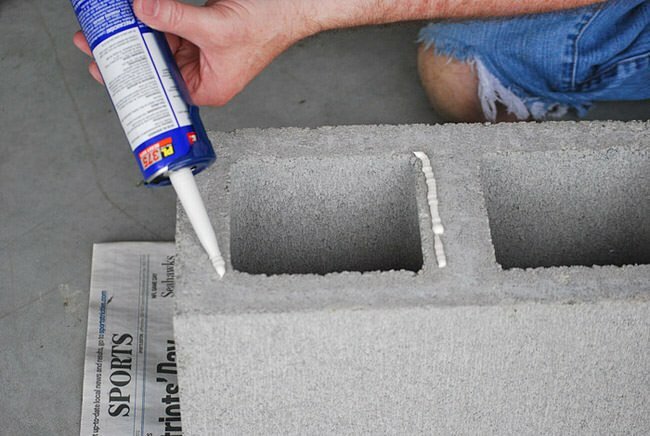 Here’s our DIY cinder block planter instructions. 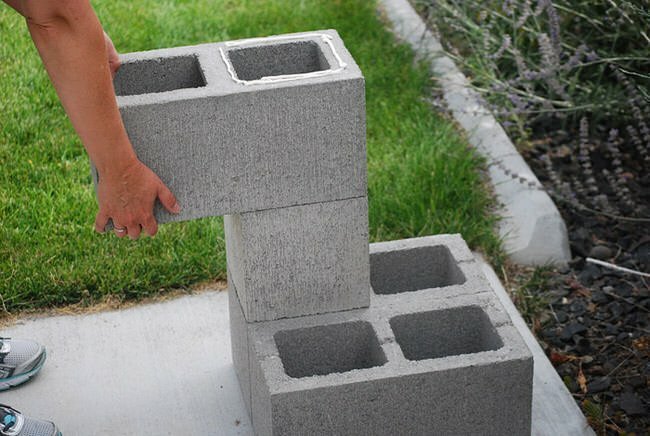 Cinder blocks. We used both dual and single blocks, as I mentioned above, work out your own design, or copy our photos. We used 5 duals and 2 singles. Metal flashing rectangles, precut that we found in the roofing dept for 59 cents a piece. Be careful their edges can be a little sharp.We heard there are such things as cinder block caps, but good luck finding them. Landscape adhesive and caulking gun. 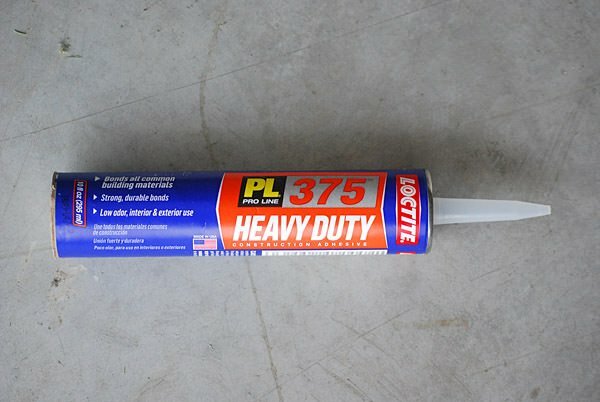 We used Loctite PL 375 heavy duty construction adhesive – good for masonry and metal (Found in the paint department at Home Depot). Worked like a charm. We felt like they need some weight on them as they dried, so we simply flipped them over onto a piece of newspaper, so that the cap was on the bottom. That way, the weight of the block worked for us. Yes, some of the adhesive sticks to the newspaper, but it peels off later with water really easily. 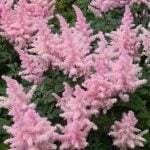 Plant with a lightweight potting soil and 4 inch plants. We used sedum (and one lavender!) because they love the porous nature of the cinder blocks. 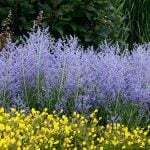 Also, ours will be in sun much of the day and these will thrive there. If yours is in shade, how about ferns and mosses? 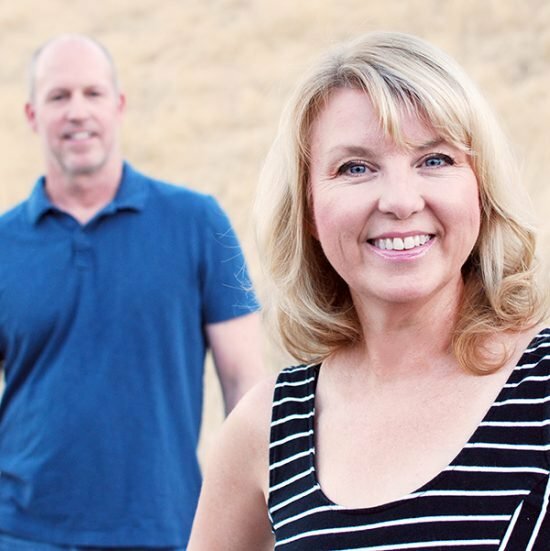 We love the way it turned out. It has a cool urban garden look! Pin a photo to share, or just to make sure you save this idea for yourself, for later! 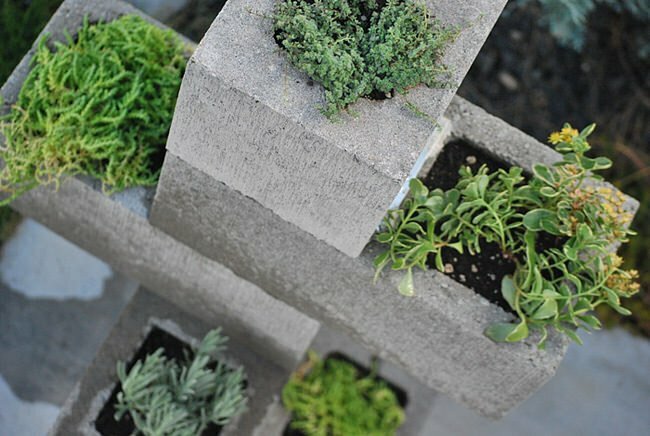 If you enjoyed our DIY Cinder Block Planters, you will love our DIY Concrete Projects and 5 Ways to Use Cinder Block in the Garden! 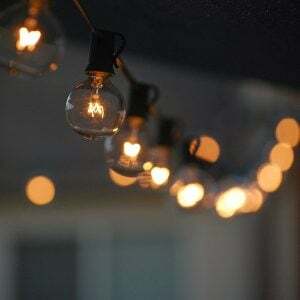 ← 9 Stunning Ideas for Outdoor Globe String Lights! 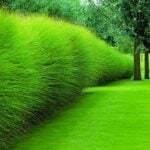 How to Make Your Garden Lush! They are attached to the bottom of each block. 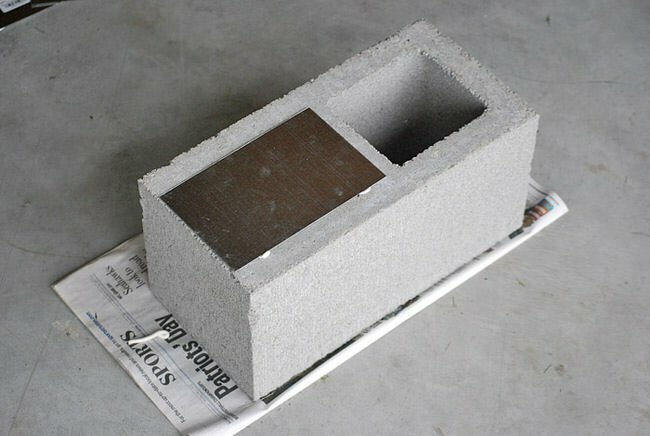 Cinder blocks are open on both ends, so the metal creates a bottom for the “pot” if you will… Hope that helps! Would definitely use a length of rebar into the ground to stabilize the tower.. I wouldn’t want to take a chance that after years in the elements that the adhesive could fail. It just takes one unsupervised child trying to climb it to cause a catastrophic injury. Would a 4×4 work as an anchor down the middle of the blocks along with the metal flashing? 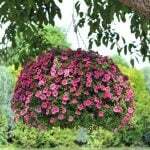 Looks like it would make a great herb planter or a strawberry one. Could you explain a little more detail? How would you attach the blocks to the 4×4… and are you suggesting it for extra support? I think M. J. meant to place a 4 x 4 into the ground then “thread” the blocks onto it through the holes in the blocks that are lined up on one side. (maybe as more support). Not sure if I helped. I’m trying to figure a way to incorporate a mailbox onto it and have it look good. Any ideas? so how’d it hold up over winter? Still going strong, and we got record snow for our area! Easy-peasy, and easily under $15, maybe even $10, as some of the items I got gifted. Turned out as pictured. 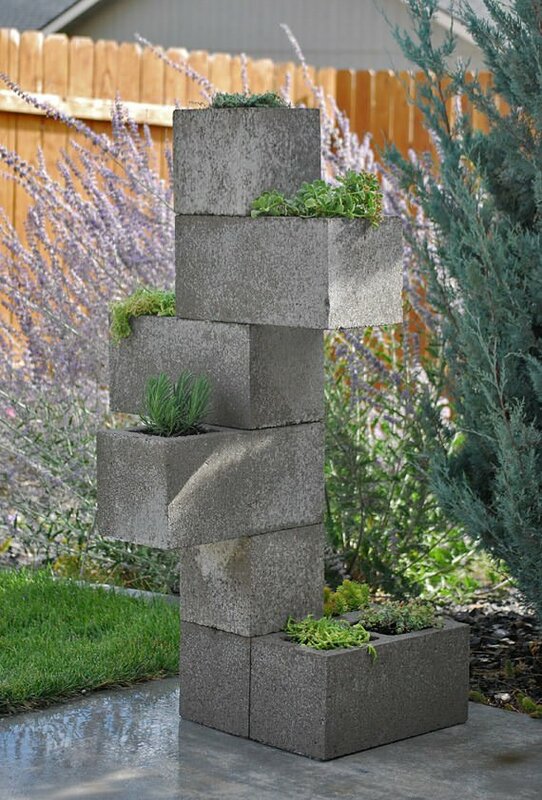 This is a total DIY anyone can do — but do it with a friend/your mate for sure to stable the blocks as they pile upward. 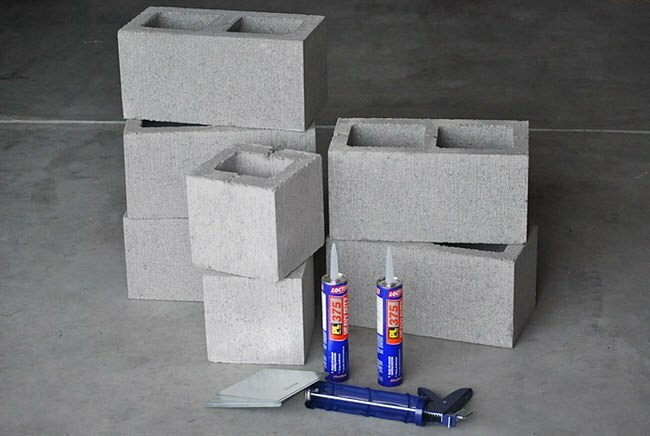 I have looked everywhere for these types of cinder blocks and cannot find them with all four edges being flat. Where did you get these blocks? Absolutely love it. Love the vertical and smaller version, than what I have seen before. Plan to make one soon. Thank you so much for sharing. Thanks Patty! It was fun to make, and it’s still going strong! Muito criativo ,amei vou fazer um igual. I will be borrowing your idea in Madison, WI! I love this look. It’s very balanced, yet edgy with great lines. 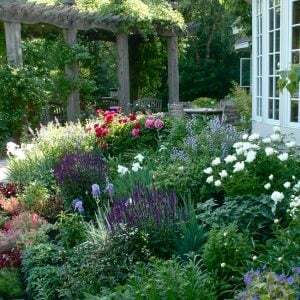 Contemporary yet feels earthy for an interesting container. I wanted to paint some on the blocks, but wondered about the porousness of them. Would it work or just rub off and fade quickly? We haven’t tried that, you might want to try a concrete stain? Great idea, I love succulents and will try this. It would be fun to paint different colors. If you put a piece of rebar through the stack into the ground it would reduce the risk of falling over. Does the adhesive pose any toxicity issue with using this design for growing herbs? I really like this idea, just moved to a house and I want to try this. Any idea how this would weather with a load of snow on it? Would the balance be thrown off? Would you need to disassemble it each winter? We will let you know, as we do live in an area with snow… however, it is pretty sturdy,I’m not too worried about it… Will update! I do not think that snow would be an issue. Not enough could accumulate to make a difference. I live in Canada and we use concrete blocks for many projects here. 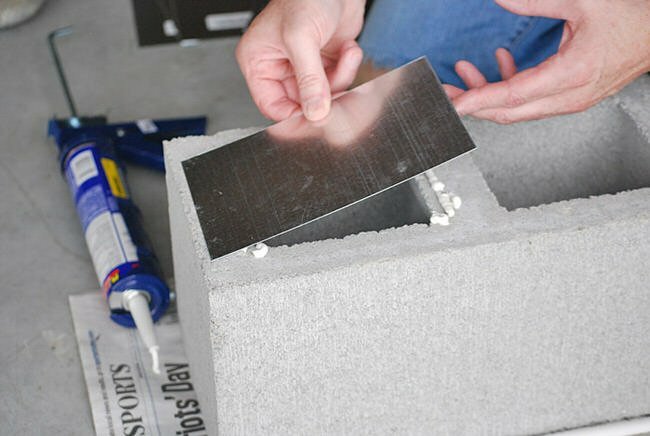 Is the concrete so porous you don’t need to drill holes in the metal for drainage? To keep the flashing/glue from sticking to the newspaper, it might work to put a sheet of parchment paper under the block as its drying.